A little early in the week to be doing a chocolate review, but that would be because I wasn't planning on reviewing any Halloween chocolate until I suddenly happened upon these two at World Market and decided that I might as well. This is chocolate I would normally avoid, but given that specific holiday chocolate can be scarce (especially strange given the abundance of candy around Halloweentime), I'll sometimes just go ahead and cover a little bit of novelty chocolate like this. There were in fact three Halloween bars for sale from Astor Chocolate. I picked up the Jack-o-Lantern and Frankenstein's monster bars. There was also a witch, which I skipped because it was simply a plain dark chocolate. There is never much to say about plain (milk or dark) novelty chocolate. 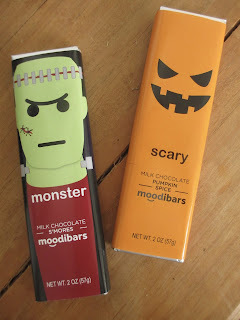 These are part of Astor's Moodibars line. Most of them are emotions, like Grumpy or Happy or Tired. These are a little different, though. The Pumpkin Spice Milk Chocolate is Scary and the S'Mores Milk Chocolate is Monster. And you know what's scary about them? How plain the bars look. Especially when it's novelty chocolate, you kind of wish there were more novelty to it than just a boring Halloween label. But that's just the way of novelty chocolate, so perhaps I shouldn't complain. Let's start with the Monster bar. Immediately, the chocolate smells like milk chocolate with a hint of marshmallow and tastes pretty strongly of marshmallow, as well. The milk chocolate is milk chocolate; nothing to say there. A slightly crunchy texture at first seems to come from the marshmallows since they're the strongest taste but is probably in fact from the graham cracker element. They don't add anything to the taste. The vanilla flavor is a taste you'd already expect to get from the marshmallows and the chocolate so you associate it more with them than with the graham crackers--and anyways, there is no vanilla in the "graham crunch" in the ingredients and in fact the last ingredient is "french vanilla," so that vanilla flavor is in fact separate from the chocolate and the marshmallow, as well. It's a nice chocolate candy. I won't say that it isn't. I'm going to finish eating it, kind of gladly even. But the chocolate itself isn't great and the flavors aren't anything that another company couldn't do just as well. Now we'll move on to the Scary bar. Pumpkin Spice is definitely a scary concept these days, so this one is aptly named. The smells is warm like nutmeg, so nothing scary there. When I snapped off a piece, I was surprised to see a kind of filling inside. You know, the type that looks and acts almost the same as the chocolate but is visible as a separate, softer element. That seems to be where the flavor is. And um, this is not one of those cases of pumpkin spice as in the spices you use for pumpkin products; this is pumpkin spice as in spiced pumpkin. There is a weird, wannabe pumpkin flavor and simply a bad flavor that my mouth is rejecting as either a spoiled taste or a taste so artificial that it is foreign and unpleasant to me. Just adding cinnamon and such to milk chocolate is in fact quite nice and this could have been another pleasant chocolate candy--except that it tastes bad. When I checked the ingredients here, I did see the culprits: pumpkin powder, pumpkin pie flavor, and pumpkin spice extract. Those are apparently part of the "pumpkin spice ganache." I hate to put a bad name on ganache with this. If Astor used better ingredients, they could avoid such negative flavors. But I guess that isn't what they aim for. This one is so unpleasant that I won't even be finishing it. I do dislike to be so negative. I thought I was just going to go with the casual "they're fun to eat but they're not great" comments. Instead I'm illustrating why I normally just avoid reviewing chocolate like this: it isn't fair to dwell too much on the negative. Yet this post also ends up being a commentary on the need for more seasonal chocolate of decent quality (with a long shelf life, that is: chocolate shops do make seasonal truffles and things that are often quite nice). And Halloween, too, seems to keep getting bigger and bigger year after year. Instead of just having scary bad chocolate, why can't we get some spooky and delightful chocolate, too?